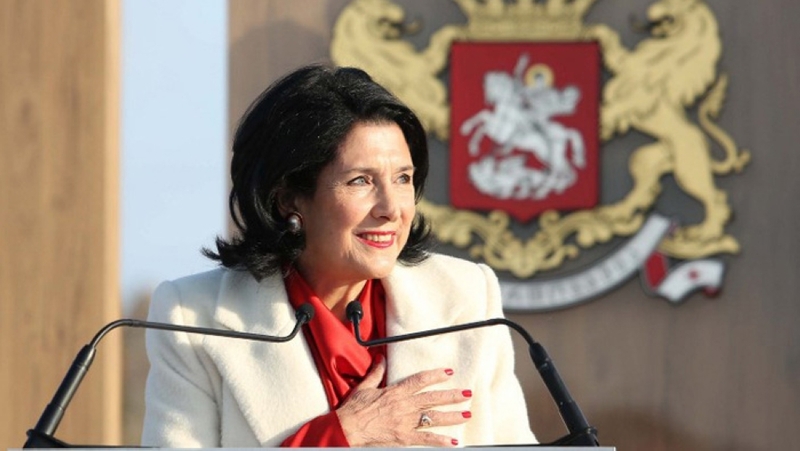 (Telavi) – Georgia swore in its first female president, Salome Zurabishvili as opposition parties continue to denounce her election as fraudulent and demand snap parliamentary polls. The inauguration paved the way for a new constitution to come into force, transforming the country into a parliamentary republic with a largely ceremonial president. The event was held in the mediaeval town of Telavi in Georgia´s eastern winemaking region of Kakheti. French-born Zurabishvili, 66, took the oath of office in the courtyard of an 18th-century manor that belonged to Georgia´s penultimate king Heraclius II. “The goal of my presidency is to make Georgia´s democratic development and its path towards Europe irreversible,” she said in an inaugural speech. “I will facilitate this process with the support of our strategic partner, the United States of America, and our European friends,” she said. Opposition parties have refused to recognise Zurabishvili´s election and tried to hold a protest rally outside the royal residence. But the plan was thwarted by police, who on Sunday morning blocked a kilometres-long opposition motorcade on a road leading from the capital Tbilisi to Telavi. Pro-opposition Rustavi-2 TV channel reported that clashes briefly erupted between police officers and protesters as they tried to break through police ranks.